Global Citizenship Action Project (GCAP) is a global citizenship program designed as a professional conference for students. Montessori Middle schoolers from all over the United States, Canada and elsewhere gather annually in New York City to hear from speakers on a variety of global issues, tour the United Nations and visit a permanent mission to the UN. The aim of the program is to inspire young people to learn what they can do to become better educated and more productive global citizens. 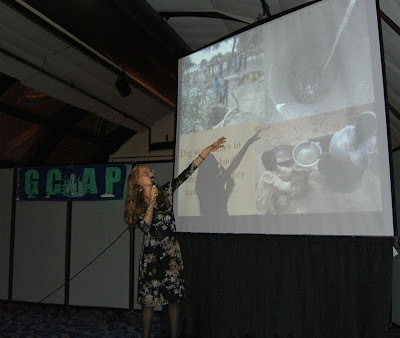 This year, GCAP invited Ariane Kirtley to speak about how the severe conditions of the lack of water in the Azawak of Niger, West Africa affect the lives of the people, what Amman Imman has accomplished to begin bringing water to the region, and how students can get involved in a grassroots project that takes an active and personal stand in addressing this global issue. 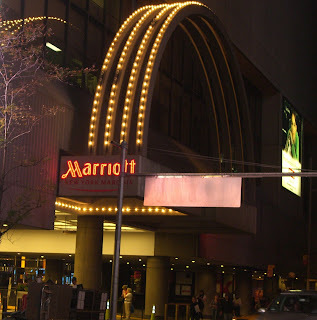 Approximately 125 students, from 16 Montessori schools from all over the United States as well as Canada and the Dominican Republic, gathered in the Marriott Marquis Hotel in Times Square in New York City to hear about the Amman Imman project at the opening session of the GCAP conference on Sunday evening, October 21. Dr. Ruth Selman, the American Montessori Society's representative to the United Nations and a leading Montessori peace activist, welcomed the students. Dr. Selman explained that the idea to bring students together in this way through GCAP came about because "the decisions you make at this age will help you make a better life when you are older" and contribute toward a better world. "You represent the future of peace in the world, " she proclaimed. It was an inspiring message and one that spoke to the hearts and intentions of the young people gathered in the room to learn how to engage as global citizens and take positive steps to bring about a more peaceful world. Three students introduced Ariane Kirtley to the audience as a former Montessori student who grew up in West Africa and discovered this abandoned region when she traveled to the Azawak as a Fulbright scholar. When she discovered that the greatest need was water and yet that no aid organizations were helping the 500,000 people who live there, she started Amman Imman. One person, making a difference, makes a difference. 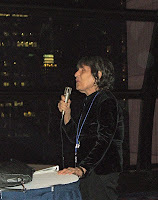 As the students sat amidst the flashing lights and neon signs of Times Square in the climate-controlled 16th floor conference room, Ariane began her presentation by letting the students know that she was going to tell them stories of people whose lives - whether they live or die - depend completely on their environment. 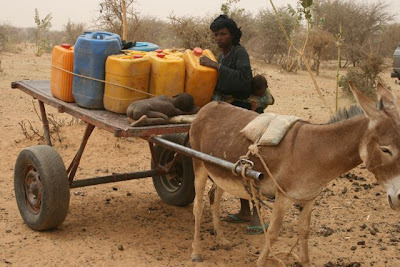 In a society where we simply have to turn a faucet when we are thirsty, switch on the heat when we are cold and turn up the air conditioning when we are hot, can we comprehend the uncertainty of life for people in the Azawak where temperatures soar to 125 degrees and the amount of rain that falls controls whether they live or die? Ariane explained that in the country of Niger, the poorest country in the world, the rate of child mortality is very high. One in four children dies before reaching the age of five. 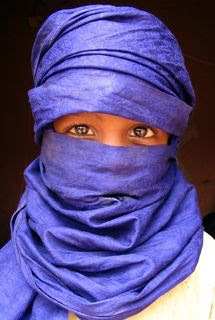 But in the region of Azawak, the statistics are even more dire. In this region, one of two children die because they do not have water to drink. Ariane brought the point home when she asked students who have just one sibling to raise their hand. "If you lived in the Azawak, one of you would not be alive today," she told them. While the reality of these stark facts are hard to imagine for our 7th and 8th grade students who have the privilege to sit and learn in such a conference room, the truth is that many people around the world, such as those who live in the Azawak of West Africa, do not have this luxury of reflection since every moment of their lives are occupied with survival. As students learn about what it means to be a global citizen, this is an important reality to begin to understand. Yet to turn reflection toward action and begin to bridge that gap of difference takes passion and initiative. Passion begets passion. Ariane's presentation struck a deep chord in the students. Many gathered around her after the presentation to ask questions and find out how they could help. Here was a person, who, after finding out that the basic needs of people were not being met, set out to change these circumstances. As the conference continued the students heard from speakers of other organizations such as Heifer International, Adopt-A-Minefield and BRAC USA. Yet even as the conference ended on Wednesday afternoon, one of the students looked over at his sister, and referencing Ariane's talk said, "You know, one of us wouldn't be here". The organizers of the conference received terrific feedback regarding the Amman Imman presentation. Student assessments repeatedly listed Ariane's presentation as a favorite session. Amman Imman's partnership with youth around the world links students to global action where their actions have an impact in productively changing the world. One person making a difference, makes a difference. This is a project of hope through which students experience what it truly means to take action as a global citizen. If you would like to get more information or to request a brochure about the Global Citizenship Action Project, please contact GCAP at harl1111@aol.com.